Click image for access to document. 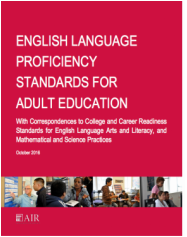 ​"This report explains the English Language Proficiency (ELP) Standards for Adult Education and their relevance to adult education programs with Correspondences to College and Career Readiness Standards for English Language Arts and Literacy, and Mathematical and Science Practices." "Find new tools and resources to advance instructional quality and to better serve English Language Learner(ELL)s.
This site provides three suites of new evidence-based resources. Each suite contains an issue brief, online learning modules, and a companion learning resource. Use these resources as a professional development tool or to help you plan and deliver lessons. These resources are intended to build the capacity of teachers, programs, and states to improve and sustain the effectiveness of adult ELL instruction nationwide." "A free professional development network for ESOL practitioners. The resources developed through this federally-funded initiative were designed to broaden, deepen, and strengthen the knowledge and skills of educators working with adult ELLs." This kit contains information for everything from Assessment and intake to how adults learn and planning instruction. It has resources for tutors and teachers and lessons that can be copied and used at all levels of instruction. This guide provides sections on skills strands (Speaking, Listening, Navigating System) and competencies within those strands in the areas of Life Skills, Academic, and Career Readiness. A site for adults to improve English speaking, pronunciation, listening, reading, spelling, writing and grammar. "Episodes and resources to help practice English and learn about helpful City services. Read about the stories, learn more about the characters, and find out how they work together to solve problems and create better lives for themselves. Learn useful English phrases and words for use in realistic situations, like going to the doctor or talking with a child's teacher. Download the magazines and video scripts in English, Arabic, Bengali, Chinese, Russian and Spanish." A site "providing learners, teachers and organizations with a one-stop resource for locating citizenship preparation materials and activities." Resources and information for immigrants regarding benefits or services related to citizenship.